An important part of the current US Pacific strategy is the US-Australian alliance. Since World War II, both nations have remained allies. On the surface, that alliance appears to be straightforward and reliable from both sides of the alliance. However, while it has been reliable and consistent over time, it has not always been simple, and citizens in both nations have not always viewed it the same way. Both Australia and the US agree that their alliance is important, and while both governments avoid labeling the alliance as being primarily a shared defense against Chinese aggression, both governments work from that assumption in their relations with one another. 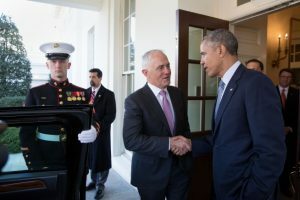 The biggest complications in US-Australian relations have generally come from public opinion, as opposed to conflicting policies. One stark example would be World War II. Australia has only had an independent foreign policy since 1940. Previously, its foreign policy had been controlled by the UK. In spite of this, the Australian and US governments were able to work together very well during the war. However, many citizens from the two countries did not work together quite so well. When US General Douglas MacArthur arrived in Australia, at the request of the Australian government, he took over overall command for allied forces for the Southwest Pacific area. MacArthur did a good job in military terms. In public relations terms, he was a disaster. When Australian troops won important battles under horrible conditions, such as on the infamous Kokoda trail in New Guinea, MacArthur and his staff announced these victories as “AMERICAN (and allies)” victories. This was done loudly on three occasions. The Australian troops deserved the highest praise, but they received mostly criticism from MacArthur and his staff. Also, when joint forces consisting of US, Australian, and New Zealand troops won battles, MacArthur and his staff announced victories as “American” and usually failed to mention the Australians and New Zealanders at all. To make matters worse, thousands of Australian soldiers had been fighting and dying in North African campaigns for many months before the US fully entered the war. With so many young Australian men serving overseas, Australia was very vulnerable to Japanese invasion. The US merchant marine fleet had already suffered heavy casualties in men, ships, and war materials in the North Atlantic prior to actually declaring war on Japan and its Axis partners. The UK needed fuel and food to survive, as well as millions of tons of war materials to rebuild its army. From the US point of view, committing to defend Australia was a major step requiring a monumental logistical effort. That logistical challenge had to be undertaken without decreasing the flow of supplies to the UK. In light of that difficult situation and Australia’s vulnerability to Japan, members of the Australian government chose not to take issue with MacArthur’s megalomaniacal personality because it assumed that, without a US General in command of the area, the US would be less generous in sending food, weapons, ships, planes, and troops to Australia. With thousands of US servicemen roaming the streets of Australian cities and spending more money than most Australians could afford to spend, friction between the locals and the US troops increased. On November 26, 1942, tensions boiled over in Brisbane, resulting in two days of rioting between US troops on one side and Australian troops and civilians on the other. One person was killed, and dozens were seriously injured before military and civilian police were able to regain control. Fortunately, despite the obvious animosity between many of the troops and civilians, the alliance between the US and Australian governments kept right on rolling. While I have no reason to fear any further rioting between Australians and Americans, the public perceptions of the voters in Australia don’t always seem to be in step with Australia’s foreign policy toward the US. Like the US, Australia is a democracy and opinions change over time. With opinions, foreign policy and defense policies change as well. This is normal for any democracy. For Americans, it can seem as though Australians don’t hold a favorable view of the US and its citizens. The issue is likely less serious than it may appear from the US point of view. We Americans should consider that Australians may share the same basic language, but we do not share the same basic culture. For outsiders, Australians often don’t seem to like anyone including other Australians. Australians understand it differently. They simply have very different social norms than Americans do. What most Australians do share in common with most Americans is an increasing concern over Communist China’s behavior in the South China Sea, and this is reflected in their changing defense policies. Australia is increasing its defense spending and has committed to several major defense programs. Australia is involved in the F-35 fighter program. Like many Americans, cost increases and testing delays have made some Australians wonder about the wisdom of the F-35 program. In spite of whatever rhetoric and soft-speak diplomacy we might hear from Australia, the F-35 program is strong evidence of a shared defense commitment between the US and Australia. Much of the political rhetoric in Australia is designed with the People’s Republic of China in mind. Communist China has made a strong career of being easily offended, outraged, and otherwise rabid and irrational whenever anyone from any country says anything that might be even slightly out of step with its dictatorship. China loves to pretend to expect everyone on the planet to cower toward its authority in the same way its own citizens must cower. So why does Australia care if China gets upset? There are several reasons. The obvious one is trade. China remains an important trade partner for Australia. For American observers, the less obvious reason is geography. We all know where Australia is on the map, but it’s not easy for Americans and Europeans to quite grasp how important Asia is in the minds of Australians. Australians recognize and accept the importance of their military and economic alliance with the US. They just don’t want it to be the single issue in their foreign policy. The US administration is in an election year, and naturally, the fanfare that accompanies any foreign policy substance is important. The Australians almost always prefer less fanfare. While maintaining close relations with the US, Australia is also actively seeking better relations and trade with its Asian neighbors. The Australian Ministry of Defense recently considered purchasing new submarines from Japan. Last month, the final decision was made to purchase French-made submarines. Ten years ago, it would have been politically difficult for any Australian politician to openly discuss the possibility of such a purchase from Japan. The fact that Australia is pursuing a broad foreign policy strategy is in no way a hindrance to US-Australian relations. The current US-Australian alliance is healthy, and my best guess is that it will continue to improve. Australia will not always provide the political rhetoric that we might hope it would, but its foreign policy agenda for the Pacific region closely resembles the US agenda. This alliance is strong and will remain so in substance, regardless of changing political tides and rhetoric. Next week, we will look at how US-Vietnamese relations are changing.